We humans live in a special time. We are on the verge of a big change and few of us have already realized it. Why is our time special? Life is cheaper, easier and more convenient than only 50 years ago. And there is no reason why this progress should stop soon. Our living generations are richer and have better lives than any human before us. We have access to unlimited information, free communication and can buy almost anything we want. As you can see in the chart, our population is growing accelerating. There are more consumers, more markets, more brain power, more people on earth with the same limited resources. That opens many opportunities and challenges. In the last 300 years we grew from 500 million habitats to 7.300.000.000 today. 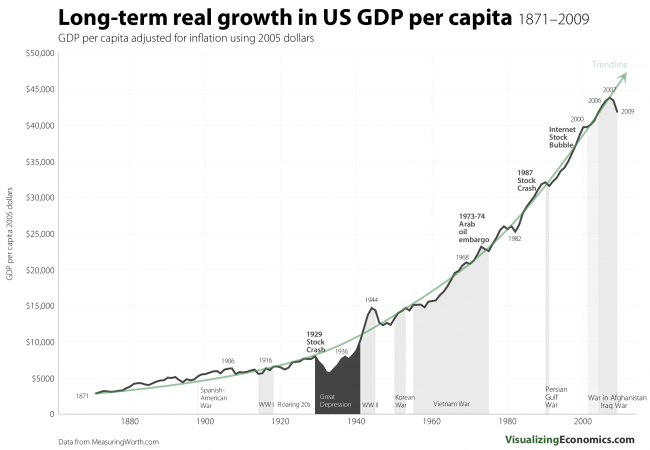 Our income per head (GDP per capita) increased constantly. Have a look at the USA. We are becoming richer day by day. The poorest people of present age can have a better life than a king a few hundred years ago in terms of living conditions. Just imagine that everyone could have access to running water, electricity, public transporation, a house, a fridge or fresh vegetables. What once was luxury is today a commodity. That means even we are more people on the world, we all have a better life than our ancestors. I am thankful for that. Have you ever thought how life was before our time? In 1900 there were no computers and almost no cars. In 1800 there was no antibiotic. In 1700 no humans rights or constitution. In 1600 no freedom to chose your own religion. In 1500 most could not read. In 1400 there were still water pipes with lead. This list could go on forever. I want to express, that a lot of lives improved. Not only for the top 1 %, but also for the other 99 %. We just do not see it that way. In the 16th century, 80 % of the population where farmers. Today there are less than 2 % of us in the agricultural business. Who wants to be back on the fields, cutting corn with his hands during summer time and sleep with 10 people in one room? Let’s talk about technology. How did technological improvement help us? Today a smartphone (I take a iPhone 6) replaces many things on your desk: typewriter, paper, pen, fax machine, scanner, computer, stamps, envelopes, modem, cables, trash, desk lamp, paper weight, ink pot, telephone and a lot more. And think about the computing power of your device. In the 90s your would have to pay millions $ for that kind of electronic device. And there are many other benefits of present age we often do not appreciate. Communication is almost for free and awesome fast. 200 years ago you had to send a letter, wait for weeks for a response – if it every arrived. Then there was the morse code. Have you every tried to tell your wife, that you are late for dinner with morse? And do you still remember the time, when there was only one telephone in each home. You mum had to yell, that a friend was on the line and you should come down. Today we have skype and can call everyone everywhere for free. I still remember the times, when I paid 3 $ per minute to call family in the USA from Europe. And do you remember to leave a voicemail in the 90s and waiting someone to call you back instead of texting? Today we have whatsapp, telegram, iMessage and FB messenger. Instead of collecting mail addresses and sending letters once a while, we just check their Facebook status. We save a lot of time, money and still stay up to date. Information are free. Really. That is such a great thing. I still remember the time when my parents had to buy a Brockhaus, because I was always asking so many questions. Today I love to spend hours on wikipedia and learn so much. For free. And everyone else can access this great knowledge too. For free. And thanks to Google, Youtube and twitter we have news in real-time. And that is free too. No need to wait for the newspaper anymore, which is old in the moment it arrives. Consuming goods are also cheaper than ever. Today you can compare any price at any time. You just go in a store and check the price online. If the store is too expensive you order with Amazon prime and receive the good the next morning. Before you spend too much money on a car, fridge or smartphone you compare prices. It is way harder to sell you a bad product, when you read reviews beforehand. Cheating customers with bad services and too high prices becomes almost impossible. At the end we, customers win. Quality wins. Transparency wins. Transportation became better too. Would you fly with planes of the 30’s over the ocean? Or imagine cars of the 1970’s. They were always broken and needed over 20 liters fuel for 100 km. There was no air conditioner, no power-assisted steering, no Bluetooth, no navigation system, no seat heating and no electric window lift. We had to crank a the window for minutes each time we wanted fresh air. Are you still going to a travel agent to book a flight ticket and a hotel? Do you still go to blockbuster and rent a video cassette? And do you still dictate letters to your typist? 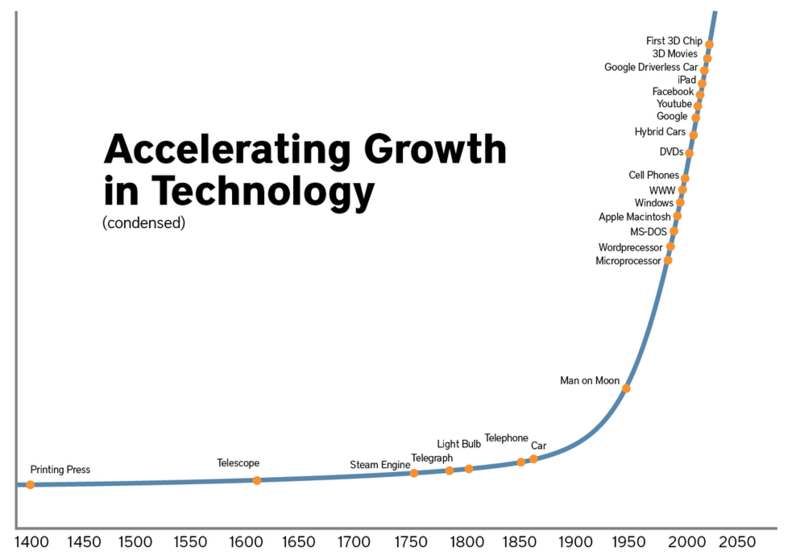 Have a look at the chart and you see, that many improvements happened in the last 50 years. Within one generation our lives improved a lot. And that improvement will continue to accelerate. Now I wish you all happy holidays. We are living in the greatest time of human existance and life will hopefully become even better.